> What is a Market Economy? A market economy is based on supply, and demand. Within a market economy, demand refers to what customers want and need, along with how much those customers are willing and able to purchase. Supply refers to how much of a product can be produced to meet the customer demand, or how much suppliers are willing and able to sell. Basics of Market Economy. A market economy is based on supply and demand. Demand refers to what customers want and need, so what they are demanding, as well as what quantity those consumers are willing and able to purchase based on other economic factors. So demand is what customers want and need and how much they are willing and able to purchase. Supply refers to how much of something can be produced in order to meet demand, or how much suppliers are willing and able to sell. So at certain times people may want more than they can actually buy. If there’s a recession going on, and people aren’t making as much money or aren’t able to pay for as many luxuries, then they want something, but not necessarily be able to buy it. Demand: takes into account how much people are actually able to buy. Supply: people may want to supply more of something than they actually can. They may want to sell gold or diamonds, but there’s only a finite amount of those and if they’re not able to produce more, and aren’t able to bring in more to sell at a higher cost, then you have to take into account how much suppliers are actually willing and able to sell. Now, when the needs of consumers meets the needs of suppliers, a market equilibrium price should occur. And this means that supply equals demand. People are buying exactly the amount of product as suppliers are able to produce. This price varies depending on the overall health of the economy, and the beliefs and considerations of individuals. If people believe something is worth more, they’ll pay more for it. If they believe something is cheap, they’re only going to pay a lower amount for it. If they are considering that something is safer or more reliable, then they may pay more for it, even though it may not have seemed like it was worth as much. But they consider it, and they take into account other aspects such as safety or reliability on the car, even if all the car’s components together wouldn’t be worth that much, since they’re safer and more reliable, and have a higher rating, maybe in a blue book value, then the individuals would be willing to pay more for them. For instance, the vehicle that gets the number one rating with Consumer Reports is going to be able to sell for more than vehicles that rated lower, even if before that you were able to buy it cheaper. Now that it’s gotten the number one rating, it’s safest, most reliable, best vehicle for its cost, now they can sell it for more. And the overall health of the economy: are you in a booming period of economy, or are you in a recession. If people aren’t spending as much, suppliers might have to lower their prices to get to that market equilibrium price. But the equilibrium price is when supply is meeting demand almost exactly. Now what happens if supply or demand is greater than the other? If supply is greater than demand, think about it, what is going to happen to the price? If Supply is greater, we have more products than there is actually a demand for. So the price is going to go down because the suppliers are still going to want to sell their product. So since people aren’t demanding it as much, since people don’t want their product as much, the price will go down in hopes that people will say oh well this is a good deal now, I’ll buy it even though I didn’t necessarily want or need it before. Similarly, if demand is greater than supply, what do you think will happen? More people want something than there is actually a supply of, more is wanted than can actually be produced, so the price goes up. Remember I talked about gold and diamonds. Well, gold is something that the price has continued to go up on because people aren’t able to just create it, and people the producers, the suppliers, aren’t able to get as much of it to sell, so when they get it, the price is going to go up because the demand is greater than the supply. People want more than is actually available, so the price goes up on that. 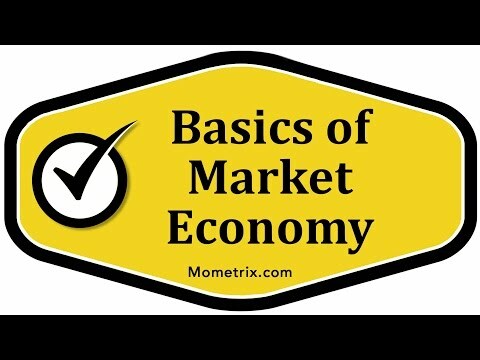 So the basics of a market economy are how supply and demand interact to reach an equilibrium market price, or to see how the price is going to fluctuate based on supply and demand, the relationship between those two, the overall health of the economy, and the beliefs and considerations of individuals. So basically, it’s always going to be based on supply and demand.